The U.S.-based ShopCasio online store currently shows all the expected new G-Shock releases as “coming soon” but there are two models that we were not expecting, the GD350-1 (left) and GD350-1C (right). The Casio.com website also shows these two watches as new U.S. releases. 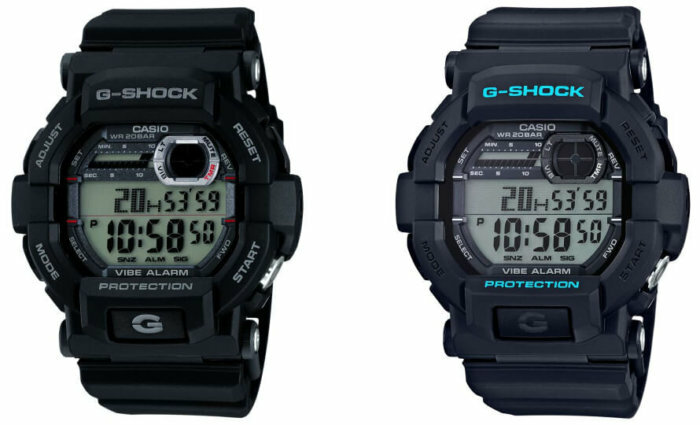 The GD350-1 is black with some red accents on the face and a slightly green-tinted display. The GD350-1C has bright blue lettering on the bezel, giving it more of a street style. The GD-350-1 was previously available in Japan and the GD-350-1C was actually released earlier this year in the U.S. albeit quietly. They each have a list price of $120 USD. Other GD-350 models currently available in the U.S. are the gray GD350-8 and the black GD350-1B with reverse LCD display. There is also a GD-350BR-1 “Garish Gold” model that was released in Japan and internationally. The GD-350 series is known for its special 24-hour countdown timer features such as vibration and flash alerts (for end of countdown alerts, alarms, and hourly time signal) and a direct access button to start the countdown timer in timekeeping mode. Other features include auto LED backlight, world time with 100 cities + UTC, 5 daily alarms with 1 snooze alarm, 1/100 second stopwatch, low battery warning, and 5-year estimated battery life.